The top end of a gentle breeze from the North East so some consistent if not too strenuous exercise for the 3 visitors and 21 local crews arriving at the Welsh Harp. Windward and leeward marks at either end of the lake, good conditions for an Open. Race officer Brian Jeffries set a long start line with a pin bias, plenty of room, and the fleet were off first time. There is a kink in the north shore of the lake, and trees shelter this shore on the first half of the beat. Past the bend the breeze was squarer to the course and there were options on both sides of the lake. Ian and Gemma Dobson found their way to the windward mark first, but the spinnaker gremlin was on board! 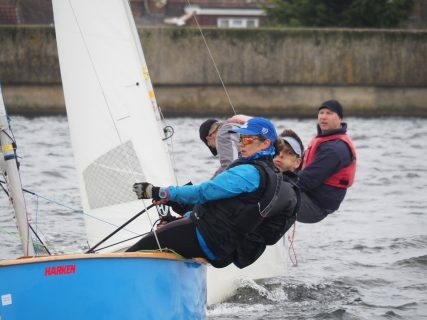 James Goodfellow and Richard Cornes took advantage and sailed into the lead . Gybing across the lake for better angles on the wind meant sailing under the trees on the North shore so the majority of the fleet stayed in the breeze to the south side, gybing once to approach the leeward mark in front of the club house. Goodfellow and Cornes maintained their lead to the end with Ian and Gemma Dobson consolidating second in front of local lads Maciek Matyjaszczuk and Andy Ferrington . 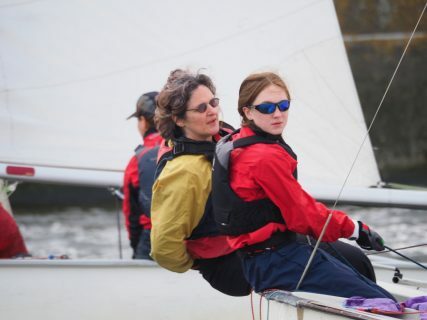 On previous visits to the Welsh Harp Ian Dobson had competed in University team racing. He was clearly enjoying the voyage to the other end of the lake and took race two with Goodfellow and Cornes finishing second. All to play for in race three. After two polite starts the third race produced a melee over towards the North shore, cautious helms starting at the committee boat were lifted in spirit, and by the breeze to sail over the chaos. Local pairing Maciej and Andy F are a rapidly improving partnership and having made the cautious choice at the start were first to the windward mark. 1st Ian Dobson, Gemma Dobson. 2nd James Goodfelow, Richard Cornes . 3rd Maciek Matyjaszczuk, Andy Ferrington . 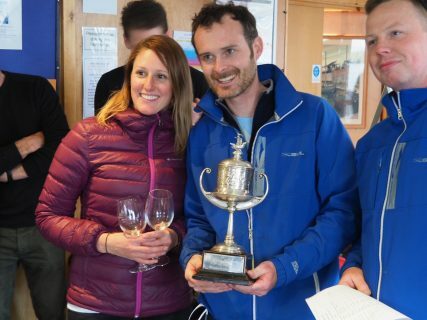 Some notable performances from Welsh Harp sailors, Tomasz Szakola and Nia Williams had an excellent fourth place in race 1, Andy Wadsworth with new, novice crew Cathy Howard were 3rd in race two. While Roger Walton and Lucy Barrie, Ruslan Scutlenic and Jim Faulkner sailed consistently well to finish 4th and 5th overall. Silver helm winner was Joel Schrire with Chris Lomax and Helen Allen with Diane Marcos won the Womens prize. Winning helm Ian Dobson thanked WHSC for a wonderful event, with particular thanks to Vivien Kenny for organising the excellent food.